Tribest`s flagship juicer, has the same patented twin gear technology and features of the Green Star unleashing every drop of nutrition from fresh produce. The added feature of the Green Star Gold is a breadstick and pasta making kit, making this the most versatile juicer available. The twin gears are made of stainless steel with plastic ends and are patented as they contain magnets and bioceramic materials in them. These magnets and bioceramic materials are said to extract higher levels of minerals out of the produce and also give fresher juice that`s enzymes and vitamins have a longer shelf life. The fact that the twin gears operate at a very low speed (110 RPM) when compared to many other juicers also helps to considerably slow down the oxidation of nutrients. There is also virtually no or very little heat transfer thus helping in retaining enzyme content. 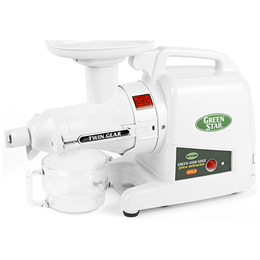 Below are reviews of Tribest Green Star Gold Juicer - For Hard Root Foods by bodykind customers. If you have tried this product we'd love to hear what you think so please leave a review. Tribest Green Star Gold Juicer unleashes every drop of nutrition from fresh produce. Ideal for juicing hard root foods like ginger and carrots. The Green Star Gold is a breadstick and pasta making kit, making this the most versatile juicer available.